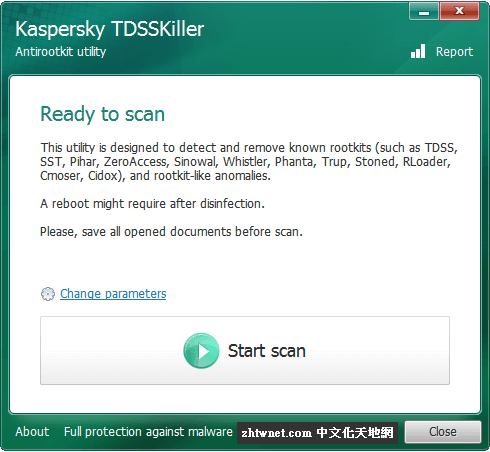 Kaspersky TDSSKiller is a portable app designed to detect and remove known rootkits and rootkit-like anomalies. TDSSKiller is portable and should be run as administrator. ITDSSKiller can be run as is or the parameters can be changed. Parameters include system memory, services and drivers, boot sectors, and loaded modules. Additional options include verifying file digital signatures, detect TDLFS file system, and using KSN to scan objects. the default parameters will work for most and should only be changed by advanced users. Simply click on Start Scan to begin and wait. Once completed, you are notified of any threats and TDSSKiller can remove any problems found. The scan is very fast and the app is easy to use.